Prior to its incorporation in 1850, Stockton had several names, including 'Tuleburg', 'Gas City' and 'Mudville'. Captain Charles M. Weber chose to honor Commodore Robert F. Stockton by naming the city in honor of Stockton, who was instrumental in the capture of California during the Mexican-American War. Stockton was the first community in California to have a name not of Spanish or Native American origin. Home to California’s oldest university. In 1851, University of the Pacific became California's first chartered institution of higher education. Home to the largest inland seaport in California. The Port of Stockton is the easternmost inland seaport in California. Stockton’s Asparagus Festival attracts over 100,000 visitors each year. The historic Bob Hope Theatre (formerly Fox Theatre) in downtown Stockton is one of only two 'movie palaces' in the Central Valley. Leonard Gardner - Author of the novel Fat City, which was later made into a film directed by John Huston. Three-times named an All-America City: 1999, 2004, 2015. Named by Sunset magazine as one of the “West’s Best Places to Live” in 2002. 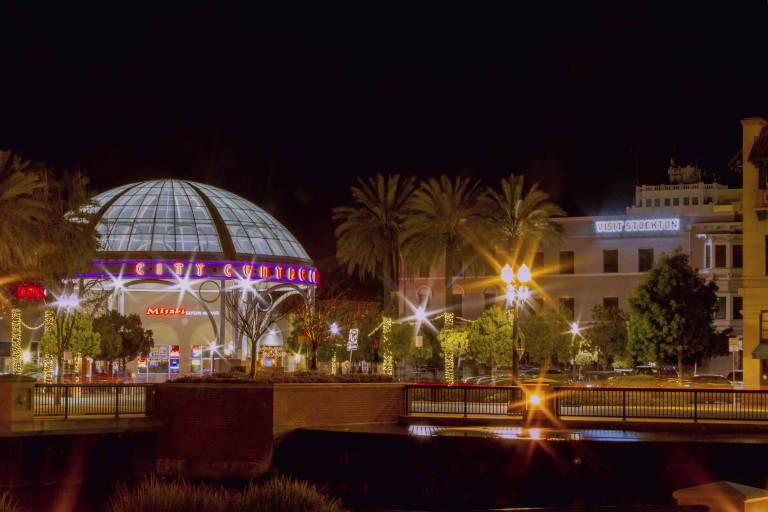 With over 100,000 trees, Stockton was thrice named 'best tree city' in the western United States by Sunset magazine. Asparagus Festival was named a “Best of the West” Food Fest in 2000.